Most species of bison have been bred with cattle at one time or another during history. The American Bison (bison bison) is unique because it's genetically pure, having only the DNA of the bison, with no evidence of genes of cattle or any other animal. I've been told that Yellowstone National Park in Wyoming, USA, has the oldest and largest population of pure American bison currently residing on public land. We live on the East Coast of the United States, and don't generally travel far away, but we really want to see some! Where are the largest number of these bison located in the Park? Are they visible throughout the year? If not, when is the best time of the year to see the most? What's the best time of day to see them? What's the easiest access route to take, starting with the entrance to the Park, and choosing which trails/roads to use? If possible, I'd like to see them without too much walking or hiking, because I'm disabled, but if necessary, we'd figure something out. Adhering to the principles of Leave No Trace is a mandatory criteria. If there are herds of pure bison in other places, including them as an option would be great too! We'd consider any place in the continent of North America. Do check out Hayden and Lamar Valley in Yellowstone. Yellowstone’s huge, wide valleys make excellent habitat for wildlife. For your best chance of spotting bears, wolves, bison, pronghorn, and many more species, head to Lamar and Hayden valleys. Time: Animals are most active at dawn and dusk. If you’re going early, aim to be in the valleys before sunrise for the best odds. Season: Hayden Valley is best spring through fall, when the park roads are open. Lamar Valley is accessible by vehicle year-round. TripAdvisor has a discussion of Lamar Valley vs. Hayden Valley. The National Park Service website has good information and safety recommendations. Each year a number of visitors are injured by wildlife. There are multiple entrances to the park, and lodging opportunities both inside and outside the park. Regardless of where you stay, you will do a considerable amount of driving travel in Yellowstone - it's huge and you won't simply park and see everything. We stayed outside the park, and made sure we had plenty of gas for each day. Beyond the simple mileage, you can be caught in "animal traffic jams" for significant periods of time. This can be either simply stuck as a herd of animals block the road, or stuck in long lines of cars who are looking at animals. Rangers will generally arrive soon to move things along, but it can take a while. We were stuck for 30 minutes for people stopping to watch geese. As you mention you're disabled, these locations offer plenty of opportunity from the road and comfort of your car or near to it. Some people bring binoculars or spotting scopes, and they're often willing to share if you don't have your own. Many locations also have good boardwalks, paved paths, or well maintained gravel pathways if you are in a wheelchair. There are many marked and unmarked driving pull-outs through out the park. Along Yellowstone Lake there are little parking areas with short walks to glorious views and often a picnic table all to yourself. Here's a teaser from our trip through Hayden Valley the first week of August in 2015 right from the car. Your opportunities will vary, but it's definitely possible. 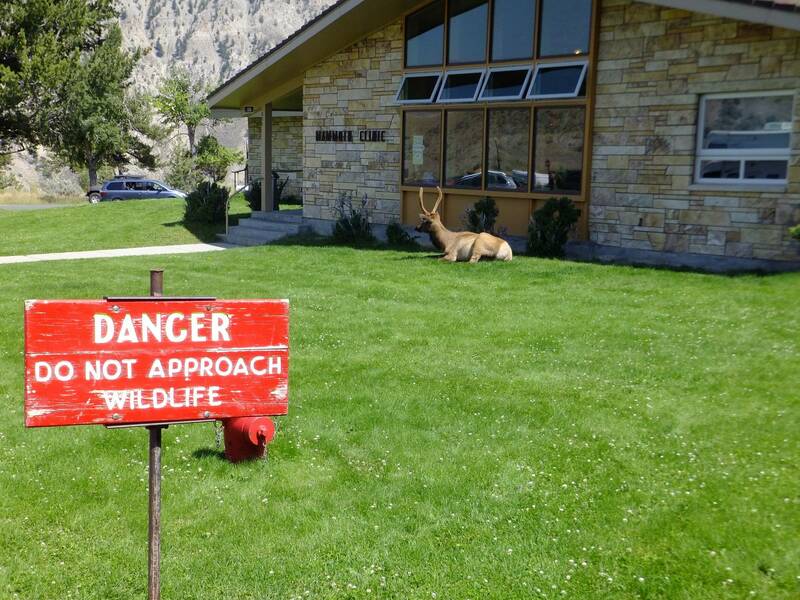 You didn't mention other large animals, but there are large populations of elk in the Mammoth Springs vicinity right in town. This picture is done with a 5x telephoto point and shoot - it seems closer than it is. I just liked getting the sign in the shot. For animal viewing. I would go to N Dakota. Drive the back roads not the mains roads. Stop at the badlands see some wild goats & buffalo. Mt Rushmore. Take the ranch roads around from there. Many are still gravel roads. Bison roam over large areas of Yellowstone, and you'll certainly spot a few from the road. They don't care about cars and humans much. I remember them being readily visible from the road in various places, particularly along the stretch north of West Thumb where most of the geyser basins are. You'll see them even if you aren't trying to. However, if you just want to see wild bison, there are closer places. Yellowstone may have the largest wild herd, but Yellowstone is also large. There are other reserves further east where there may be less bison, but the area is also smaller. I remember in particular bison causing traffic problems in Cave of the Winds. A few decided that the middle of the road was a nice place to sit for a while. When something the size of a small car wants to sit someplace, there is little you can do about it. Remember that bison are ultimately grassland animals. Their natural range does extend into the mountains, like in Yellowstone, but their real home is on the prairie. Most national forests and state parks in the prairie region have native bison. They really aren't hard to see once you go to where they live. Look, I know exactly where to see a bison's herd in Yellowstone; I was there a few days ago. By the Norris Canyon Rd, direction to Canyon Village, after Nez Perce Lake. There is a "wildlife exhibit" area on the side of the road. You park there and pretty much at whatever time of the day you can see a herd of bison that uses to hang there for water and grass. 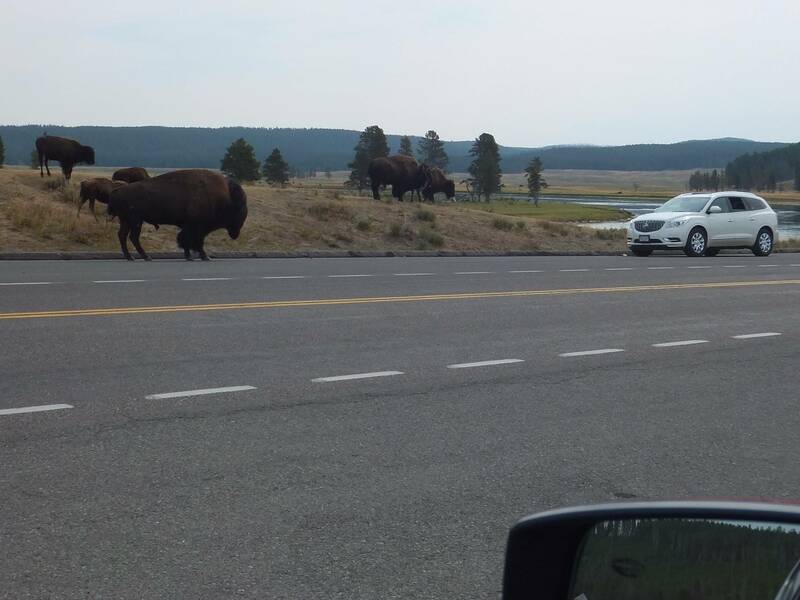 Note the fact that they created a "wildlife exhibit", which is signaled by a metallic road signal planted on the ground and comes with some asphalted park space on the side of the road, suggesting that we are talking about a habitual long-standing roaming area for bison. If it's just about seeing bison but doesn't need to be yellowstone nor in the US, there's also Elk Island national park just east of Edmonton. They keep plains bison as well as wood bison and are involved in conservation efforts particularly for the wood bison and thus do put considerable effort into making sure they don't crossbreed (neither with cattle nor wood x plains bison - which happens more easily than crossbreeding with cattle). The park is tiny compared to yellowstone (which makes it easier to find the bison): less than 200 km². You may consider it not truly wild, though: the park is completely fenced both to keep the populations pure and as a disease barrier (brucellosis + tuberculosis). IIRC, they also vaccinate the bison. Due to the fence, the bison population is rather dense, and it is regulated artificially (e.g. by taking out parts of the wood bison herd and shipping them to the north to reinforce the population around lake Athabasca). IIRC, the south part of the part with the wood bison doesn't have roads (but hiking paths). But the north part has a road lengthwise and also a so-called bison loop. I saw lots of wildlife (of course including bison) already from the road. As a side note: according to wikipedia, many bison ranchers in the US try to get rid of residual cattle DNA in their bison, and nowadays typically only about 1 % residual cattle DNA in the tested DNA. Not the answer you're looking for? Browse other questions tagged united-states animals canada yellowstone bison or ask your own question. What is the Chincoteague Pony Swim on Assateague Island in Virginia and Maryland? What breed is this very large, black, turtle/tortoise found in the Northeast United States? What Is the name of the supervolcano or earthquake epicenter at Yellowstone National Park?